I had been playing the violin for ten years before I started taking lessons with Michael. I found that in the two years I was with him, I improved more than I had during those ten long years. He is great at balancing the focus on technique with a focus on the more emotional aspect of playing. He encouraged me to play music that I liked and at the same time pushed me to try more challenging pieces, and to play and perform for other people whenever possible. Even now that I have moved away, and am studying with different teachers, I find that what Michael had taught me still influences the way I play. Michael's teaching style has been perfect for my 8 year old daughter. He is able to motivate without overwhelming her and challenges her to reach one step beyond what she thinks she is capable of achieving. He is a wonderful teacher for school age children! I studied with Mr. Michael Grossman for several years, until I was almost 11. Mr. Grossman introduced me to solid technical basics and beautiful violin repertoire such as Mozart's third violin concerto, and to composers such as Paganini, Wieniawski, Schubert, and Kreisler. What was most special was Mr. Grossman's patience in waiting for a student to adjust and the way he tailors each student's study according to the individual's style and ability. Of the many things I remember from taking lessons with Mr. Grossman is something he told me when I was playing an etude for him; I finished playing and Mr. Grossman said, "... You have to play everything musically and beautifully." Michael Grossman is a gifted artist and an excellent teacher. He has an amazing capacity for patience, even for an adult student with no prior musical training. When I came to Michael, I could not read music, and I did not even know the proper way to hold the violin. I am a left-handed person, and struggled with the proper bow hold. Michael never gave up on me and always thought of new ways to present the lesson if I didn’t seem to grasp what he was trying to teach. 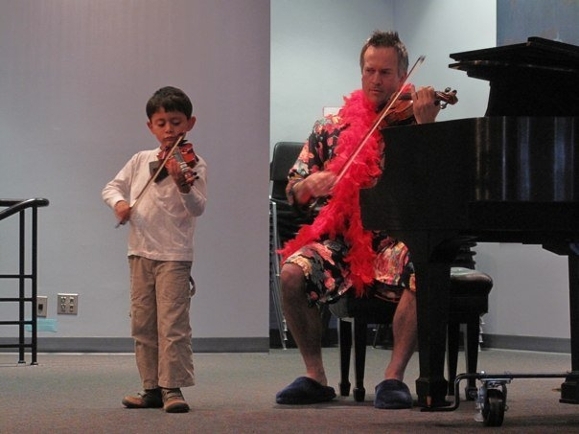 I always looked forward to my lessons with Michael and he instilled in me a deeper appreciation for classical music. I’ve had the pleasure to attend one of Michael’s performances, which served only to inspire my desire to learn. I would definitely recommend Michael Grossman to students at any level. Michael Grossman has helped me bring my violin playing to a whole new level in the past year. He provides specific comments that assist me in improving both my technique and my practicing habits. He is always constructive, and is not shy about pointing out the faults in your playing. Nonetheless, he always maintains a positive attitude that encourages you to keep trying. During many lessons, he has said that all he expects is progress, that as long as you're working towards the best you can do he is satisfied. Michael Grossman's teaching techniques have helped me stay engaged in my violin playing and have encouraged me to improve.